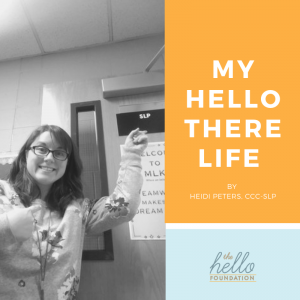 This is my 12th year working with The Hello Foundation and my 11th year providing speech therapy services via the Hello There model. I’ve worked in five states in over sixteen school districts or ESDs. Each placement has its own unique students, staff, relationships, problems, solutions, climate, and culture. I’ve been fortunate to have the same placement for the last three years, working at a big K-5 school (over 600 students) and a smaller 1-8 school. In addition to typical general ed classrooms in these schools, there are also two self-contained classrooms for students with severe/profound disabilities. There is a wide range of disabilities and most of the kids do not speak. We have students using high tech communication devices, some using switches to learn cause & effect, and others using picture exchange to communicate. I collaborate with the assistive technology specialist on using a variety of low and high tech augmentative and alternative communication systems to help these students communicate and participate in the school environment. She and her speech assistants typically come to this school a few times each week and work with my speech assistant. They set up eye gaze systems, computer-based switch activities, assist with teaching and modeling PODD and PECS, and so much more! They help keep all the communication systems going through speech assistant and classroom assistant turnover. As a Hello There SLP, I work from home 80% of the time. When I’m at home, I supervise my speech assistant over one of many webcam platforms (Google Hangouts, Skype, Zoom, etc. ), provide teletherapy, provide ongoing speech assistant training, prepare lesson plans, write progress notes, IEPs, evaluations, do Medicaid billing, consult with teachers via phone and email, schedule meetings, attend meetings, contact parents, etc. It’s amazing how much time is taken up doing these things! The other 20% of my time I am on-site, in the school buildings themselves. When I travel on-site, I typically leave on a Sunday afternoon and return home Thursday or Friday evening. This allows me to have a full 4 or 5 days of direct student and staff contact each month. I plan my travel weeks based on due dates of IEPs and evaluation so that I can get everything done in advance. I plan each travel week out ahead of time, duplicating my speech schedule and marking times that I will complete evaluations, IEP probes, consult with staff, hold meetings, etc. This helps me organize the many duties I need to complete when I’m there. Nothing like getting to the end of the week and realizing you forgot something major! I also try to schedule all of my speech-only IEPs and evaluation meetings when I’m onsite. This way I can meet the parents of these students face-to-face, rather than always being ‘that lady on the phone (or computer)’. This has worked well for all the years I’ve been providing services via the Hello There model and there have only been a few times where I’ve had to ask the resource room teacher or school psych to help me out with a meeting, generally because parents didn’t make it to the meeting while I was there or my travel plans got pushed back because of weather. I also physically attend any other IEPs or evaluation meetings for students that receive speech/language services, but don’t case manage, while I’m onsite, if they happen to be that week that I’m there. Otherwise, I attend meetings via phone or webcam. There are always highs and lows in any job. The biggest challenges for me in my current placement are staff turnover, a less-than-ideal speech room, and a challenging paperwork system (this is changing, though!). The biggest high I’ve had in this position is that I’ve been able to work with some really amazing staff and students! The rapport that I’ve built with the staff at my elementary school over the past 2+ years has been incredible. Knowing the teachers, principals, support staff, etc. has been great! When I walk in the building, almost everyone recognizes me, they’re happy to see me, invite me to school and outside events, and I feel like I’m part of the whole team. The students love interacting with me on the computer and frequently greet me with hugs and high-fives when I’m onsite. Having kids meet their goals and telling their families that they get to exit from speech is always one of the greatest parts of the job! With a wonderfully flexible schedule, I typically work long hours (think 12-13) while I’m on-site and then flex time when I’m at home. This allows me to pop into my own kids’ classrooms to help out with special events, watch my daughter in ballet once a month, take a walk when it’s nice out, take a Yoga break, or take a day off for some me time. I admit that I wasn’t very good at the work-life balance in the past and it negatively affected my health and mental well being. This has become a priority this year. I’m more focused on my health, finding ways to de-stress, and have recently been learning Norwegian on Duolingo! Jeg elsker det! I look forward to continuing my path and finding new ways to balance it all for the rest of this school year and for many school years to come.